Spring is finally here, and we have already had days in the 90's! All this nice warm and sunny weather put us in the mood to do some serious landscaping around our house! Its not quite done yet, but I could not wait to share with y'all some of the progress we have made and also get some of y'all's though and opinions on an outdoor project! 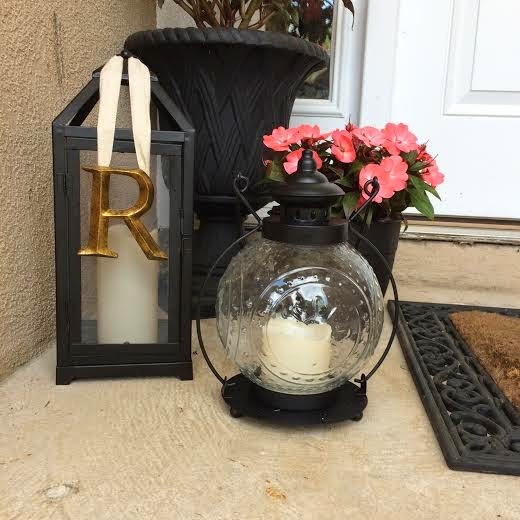 So, we have this cute little 3 light lamppost out in our front yard, and I want to decorate it with some burlap or mesh, however I don't know exactly what to do! I would love your thoughts and feedback! So here she is! It most certainly needs to be pressure washed and maybe even a quick coat of some white spray paint. What do y'all think I should do? Help! This weekend I finally fulfilled my dream of adoring my front porch with ferns! I am so happy with how they look and I think is gives a nice welcoming to the front door. Over to the left is a open space behind the column, I am thinking about getting a black rocking chair. I wouldn't mind sitting out there and sipping a sweet tea as I watch the sunset. We will be adding some mulch to the flowerbeds this weekend and I cannot wait to see how it looks! I added a little touch of pink to our American flag. Again, these ferns are making my heart sing. I am thinking of adding an R to the front of the planters, as if there are not enough R's our porch already! But, I am a firm believer that you can never have too many monograms! What do y'all think of the burlap bows on the smaller lanterns? Do y'all think they are too much? Below is a picture with out the bows. I like the bows, but I also think it takes away from the cuteness of the little roundness of them. I love having fresh blooms in my home, especially when they are 3 for $12. Bailee just cannot stay out of my newly planted and mulched yard, but she is so cute I just let her walk in it right now. Once this bush gets bigger I don't think she will be too happy. I am in love with these plants that I got for the back yard. The white blooms are so simple yet so beautiful! I hope that y'all enjoyed the sneak peak of our spring landscaping, and I cannot wait to share the rest of our project with y'all! You are too cute, but the bow on the flag needs to disappear. In my opinion, nothing goes with Old Glory ... That and strangers might think y'all just had a baby girl! And congrats on graduating!